What is the Garry Oak Nursery? The Garry Oak Nursery, now in its second full year of operation, is meeting the challenge of producing local Garry oaks. The Nursery project is run by a task force drawn from members of GOMPS and addresses the rapid loss of Greater Victoria's native flagship tree - the Garry oak. This spring, volunteers planted all the acorns that were collected last autumn and stored over winter in a fridge on site. Some 2,400 acorns were planted this spring and if 2,000 of them are viable, it will raise our total stock to about 6,000. Click here to read more about our Nursery operations. Drawing on the support of volunteers and local expertise, our goal is to produce approximately 1000 young trees per year over the lifetime of the Nursery project. The majority of the Nursery's inventory will be for sale to other municipalities, major landowners and the general public. Our aim is to have the trees planted out after they are 6 years old and of sufficient size to withstand hardships found in the urban forest. In addition, we will develop educational materials to help landowners care for the trees and ensure their survival. Large mature Garry oaks are falling faster than they are being replaced, producing a dramatic age gap between large established trees and the few recently planted young ones. Most seedlings do not survive the stresses of our urban forest due to their required care and protection from humans and animals. The general public, municipal governments and restoration projects need young trees now but few of those available are of local origin. How did the Nursery start? After years of planning, the Nursery was started in 2017. The City of Victoria has agreed to sub-licence a former nursery site to GOMPS and in return we will provide a percentage of trees to the City of Victoria free of charge. GOMPS is using two generous legacies of local estates to fund nursery operations. GOMPS is pleased to now have a beautiful nursery space dedicated to producing Garry oaks of local genetic origin. We'd love to hear from all interested volunteers ages 14+. 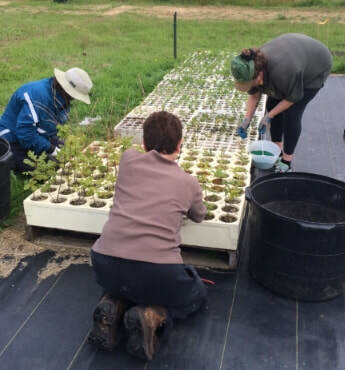 Click here to learn more about volunteering at the Garry Oak Nursery. Click here to visit our page on Volunteer Victoria.